In choosing Barbara Madeloni as president, the Massachusetts Teachers Association has elected a fierce opponent of neoliberal education reform. Barbara Madeloni is an educator and activist from Northampton, Mass., who was elected in May as president of the 110,000 member Massachusetts Teachers Association for a two year term. Madeloni defeated Tim Sullivan, the chosen candidate of the previous, term-limited president Paul Toner, who was known for his closeness to Massachusetts Gov. Deval Patrick and the state’s Democratic Party establishment. She first became known in 2012 as a professor at the University of Massachusetts-Amherst’s School of Education, where she led opposition to a proposed teacher evaluation system overseen by Pearson, the large for-profit education company. She was fired because of her activism around the issue. Madeloni is unique among labor leaders. Her level of analysis concerning the crisis facing organized labor and public education is refreshing at a time when both national teachers unions — the National Education Association and the American Federation of Teachers — seem unshakably wedded to a failed model of unionism. The NEA was one of the unions to endorse Obama for reelection despite his many betrayals of teachers unions. Under the tenure of President Randi Weingarten, the American Federation of Teachers has received millions of dollars from the Bill and Melinda Gates Foundation — perhaps the greatest institutional threat to public education in the US today. 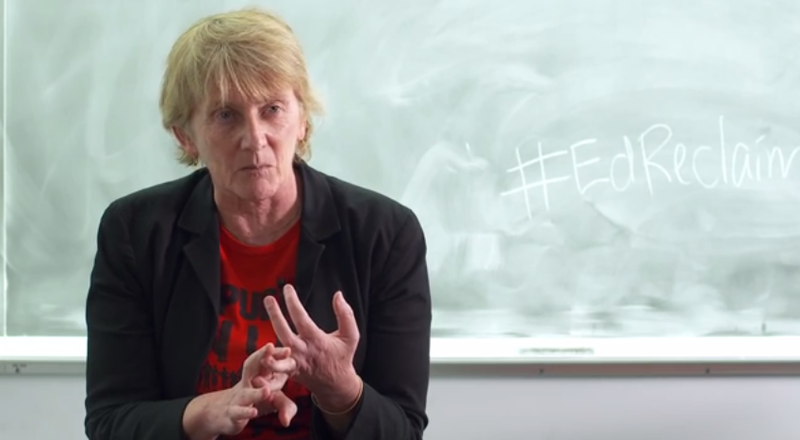 In contrast, Madeloni is committed to a fierce campaign against neoliberal education reform and is unafraid of mentioning the word “capital” or pointing out the deeply destructive role of the Democratic Party in the crisis of public education. Those on the Left interested in the revitalization of the labor movement would do well to study Madeloni’s spirited defense of public education. Madeloni was interviewed by Matthew Cunningham-Cook. Your election was considered a major upset. It’s incredibly rare for the establishment candidate to be defeated in the National Education Association (the parent union of the Massachusetts Teachers Association). What explains your victory? The word people use to describe my election is “seismic.” The election was supposed to be an ascendancy — a significant part of how I was able to win was that my opponent Tim Sullivan’s campaign thought victory was in the books. Sullivan never said anything to differentiate himself from the current president, for whom the membership was profoundly disappointed, at best. The loss itself says that the union establishment was out of touch with its members — teachers, who are in an enormous amount of pain. The joy in human relationships and the possibilities of teaching have been foreclosed by the “education deform” project. We were told by union leaders that our only choice was compromise. I offered a broader analysis that named what was happening and the hope of real solidarity and action. I said that we can actually do something about the assault on public education. I said that this was a bipartisan, corporate attack, and I provided a vision for public education that is joyful, creative, imaginative, and democratic. This helped move people from pain to analysis to “now I can know myself in a different way.” In the context of the neoliberal regime, we are deeply alienated. I emphasized that educators don’t have to be alone; we can act with others. With others, we can have agency and act, and make the world what we want it to be. The joy we experienced at the union’s annual meeting was people finding themselves again. Talk about the context in the lead-up to the election. Why was the leadership so alienated from the membership? It was an overwhelming year. The new teacher evaluation system hit, and teachers were finding it to be onerous and something that can be used to discipline teachers that administrators don’t like. The evaluation system has this pretense of objectivity, which makes it a better tool for management that wants to get rid of a teacher. Teachers were feeling oppressed by it — instead of being trusted, teachers were expected to prove themselves constantly. There was more testing for more students. There was the demand to respond to the Common Core standards. Then there was a civil suit filed saying that English language learner students were not having their academic needs met. The suit was won, and as a remedy the courts decided that every teacher needs to take a course about teaching ELL students. Teachers had to take a thirteen week course that many described as not helpful at all, neither for the teachers nor for the kids. Then there was a requirement that teachers have to be fingerprinted, and they have to pay for their fingerprinting. Then there was the legislative threat to our retiree health care benefits. There was a cascade. People were overwhelmed by the amount of the work that they had to do and the constant demand to respond to mandates. You’ve been quoted as saying that “rich white men [are] deciding the course of public education for black and brown children.” People have criticized you for this. These are just facts. Eli Broad, Bill Gates, Arne Duncan, Joel Klein — we have rich white men who are making decisions about black and brown children. The interesting thing about this is that we’re not allowed to say it. Discussing the juxtaposition between “rich white men” and “black and brown children” is important because it enables us to understand and explore the intersection of race and capital and how it relates to the corporate education reform project. What about the threat to retiree health benefits? Your predecessor endorsed the plan, which created a multiple-tier system for benefits. Endorsing a plan to cut benefits seems unorthodox for a union leader. With the retiree health benefits, teachers will have to work in the system longer to have their full health benefits covered. For someone like me who entered the field later in life, I would have to work until I was something like eighty years old to get full coverage of health care benefits. We shouldn’t be dividing the pie and saying that some people are going to get good benefits and others aren’t. When I went to the committee hearing on the retiree health benefits, the statehouse was packed with people from unions across the state. Throughout the day, people got up to oppose the bill, and it became clear that the committee would not be able to proceed with it. That positions members in a narrative about themselves that says that we are powerless, subject to forces that we can’t control. It’s painful for me to think that this is a narrative that people accept. It makes me sad to hear people talk about themselves that way. It’s such a small vision of life. What our campaign offered was a broader, powerful vision of ourselves in community. We didn’t offer a simple militancy, but a deeper power to create our world, which is something that we as educators should feel when we head out into the day. What is on your agenda as president? What do you plan to do? There was a new business item that passed at the annual MTA meeting which calls for the union to tell the Department of Elementary and Secondary Education that we want a three-year moratorium on the new Common Core-aligned PARCC testing. The same new business item goes on to say that the MTA will support member-led forums where we discuss the impact of testing and of the teacher evaluation system on students, teachers, and schools. These forums and the conversations they generate will structure the work of our first six months. From there we will, as a rank and file-driven union, choose next steps.